Filip Forsberg "Red Filip" editor in chief of Norrskensflamman. The foundations of Norrskensflammans burnt down property. T v kv Vesslan. Photographer: Helmer Wildlund, 1940. 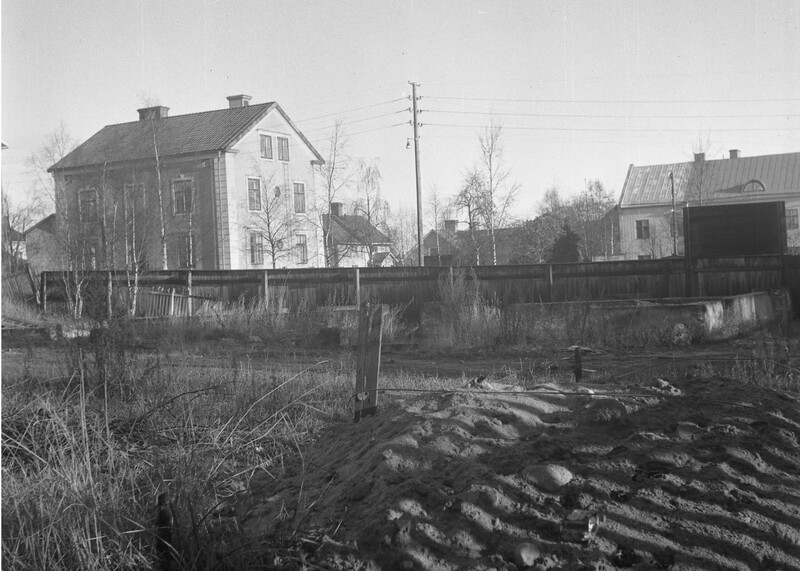 Source: City archive of Luleå. Emily Fahlén: The attack on Norrskensflamman in 1940 and the establishment of the detention camps in Sweden during the same period are two historical events that we think it is urgent to reflect on in a new political era. Most of the documentation and texts we have found about these events are from the 1970s, and in general there is not much written. Today, there is no one still alive who experienced the camps or the time after the fire first hand. You are the son of one of the people concerned. Can you introduce yourself and your way into the historical events? Lars Brännberg: My name is Lars Brännberg, and I was born in 1943. The Flamman attack took place in 1940, so what I'm relaying here is hearsay and memories from what I've read and so on. It is also true that this type of event creates myths that travel, and some parts are true and some are untrue, this is natural when it comes to such things. I was born into a working-class family who were always politically active, Jonas Brännberg, who is now in the Luleå General Assembly, belongs to the fourth generation of left-wing politicians in the General Assembly and the City Council. The source of most of what I'm going to say is my father whose name is Allan Brännberg. He grew up in a religious family, but at an early age started working at Flamman as a newspaper carrier, getting up at dawn to sell loose issues. During this time, he became acquainted with the editor of Norrskensflamman, named Filip Forsberg, he went by Red Filip and was the son of a pastor from Malmfälten in Kiruna, I believe. He was a good agitator and public speaker - he could make a rock cry. A kind of mentor relationship developed between Red Filip and my dad, so that is the background to what I’ll say here. EF: How did your father describe the political sentiment during this time, or how can we understand the background to the attack on Norrskensflamman? LB: You have to begin with the situation in Sweden in the 1930s. There were severe disputes between communists and social democrats, and the votes of the labour movement were totally decisive here in Norrbotten. After the secession of the Left Social Democrats towards the end of World War I, the party organisation went almost exclusively to the Left Social Democrats, who since became the Communist Party. This later became a section of the Third Communist International. During the 1930s, the disagreements between communists and social democrats in the county intensified as a result of the so-called Saltsjöbad Agreement, where the Social Democrats were part of a formal contract with big financial actors. (1) For too long, the communists held on to a class-against-class politics that later proved to be quite destructive - and paved the way for the emergence of fascism. During the rearmament of the late 1930s, it became increasingly clear that Germany intended to go into war, and it was apparent from Hitler's "Mein Kampf” also that he was aiming to attack the Soviet Union. Therefore, political oppositions increased the closer we came to war. And then the Winter War broke out at the end of 1939, and the Communist Party of Sweden supported the Soviet attack, which led to very strong antagonism towards the communists. It was particularly noticeable here in Norrbotten, I should say. The hatred reached furious heights, as I’ve heard been told. In this situation, the Swedish military wanted to acquire Flamman’s printing press, that is, simply assume control over it, backed by a government decision, but the government opposed. In my dad's opinion, it was this that triggered the attack on Flamman. It should be understood that in the Swedish state administration – in the deep state – there were strong Nazi sympathies from many parties. In Norrbotten, mainly from the regiments. Just after World War I, there were disputes over power, especially in the Baltic States, between the German Freikorps [voluntary independent army] and the reds. Part of that conflict was a group of Swedish officers known as “the 1905 men”, which included a man named Archibald Douglas, who later became the head of Boden’s military organisation. He was seen to be a leading Nazi here in Norrbotten. The authority on Nazi ideology in Sweden during the 30s, Per Engdahl, was a frequent lecturer at Boden’s military fairs. EF: Your father also ended up in detention camps during this period? LB: Yes, he was summoned as if for regular military service but then transferred to what the military called a "labour company". In practice, this was a kind of concentration camp. Concentration camps have two variants in Nazi terminology; work camps and death camps. Both types are called concentration camps. Storsien is the only camp there is any talk about, but there were actually many more. Flamman’s editors ended up in Storsien. They just disappeared like, snap! The only one who made it through was Red Filip, they didn’t dare mess with him, they were terrified of him because he had the gift of speech. My father sat in such a camp, but in Västerbotten outside Vindeln. He told me a lot about it. Almost everyone there were communists, there were some left-social democrats, and actually even a liberal. He was, according to my father, scared shitless. Everyone was probably a little scared because if a German attack should occur, the livelihood of those who sat in the camps would be the first item of exchange. In Storsien, it is said, they had to dig out trenches two metres long, 1,80 deep and one meter wide. That is, they were graves. In the camp my father was in, there was a trading manager and he organised a market place at the camp, where they sold goods and offered coffee. It made a lot of people from other places in the area come by, so it became a gathering place for the whole region. They also earned money to finance political activities. They were so well-organised in the camp that the officers did not dare interfere with them and break up the activities. My father first went there, then he came home, and since went in again. EF: The attack on Norrskensflamman can be seen as a kind of culmination of the tension prevailing in Norrbotten during this time. What happened just after the event? LB: Five people died in the attack. They lived at the property. And how were the perpetrators revealed? Well, there was a waitress at the City Hotel in Luleå who overheard an overly confident planning session between these terrorists just before the explosion. After the attack, she contacted the police department and the communist party in the district to let them know what she had heard. Flamman came out just a few days after the explosion with the help of hired press capabilities from elsewhere, and because they knew who had been at this meeting at the City Hotel, they opened with the headline: "Is it true, Mr Chief of Police?" So they took the story from the waitress and presented it as an open question to the chief of police, Ebbe Hallberg. 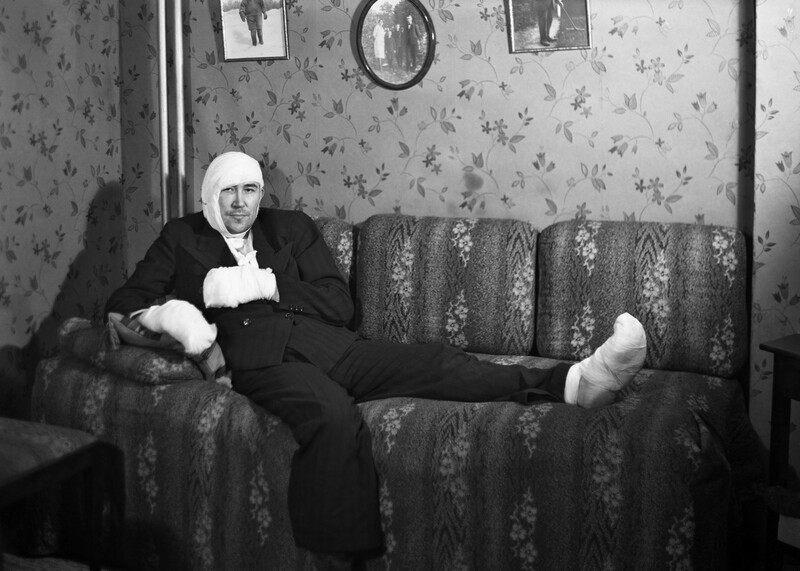 After a few weeks, Ebbe Hallberg was arrested as a suspect, and his testimony became the basis for arresting the other attackers. 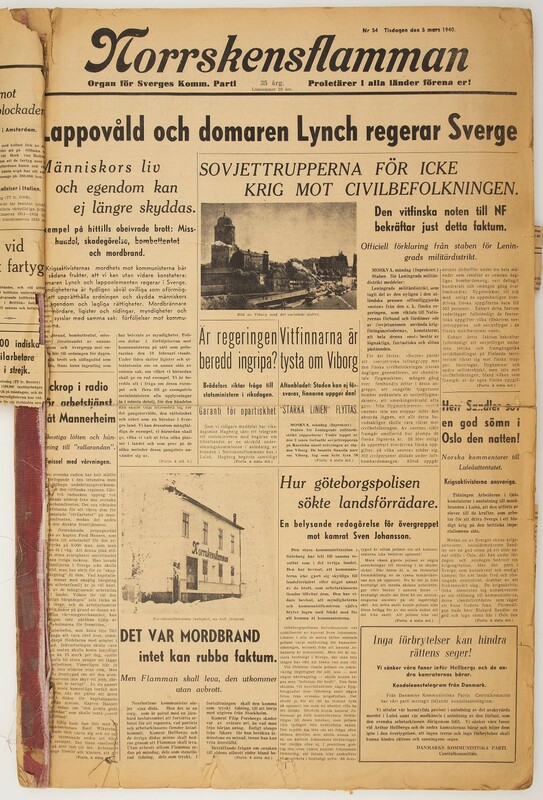 Norrbottens-Kuriren wrote that Hallberg was insane, and NSD (The Norrland Social Democrat) wrote that the fire was a parallel event that the communists themselves were probably behind. That is, someone would have set fire to the house after the explosion. But in a printing company there are cleaning fluids and so on that are quite flammable, so it's no wonder that an explosion would occur from the fire. For the funeral, thousands of people from Luleå and other places in Norrbotten gathered by the southern port, with the coffins on carriages. They began to march, but when they reached the junction at Kungsgatan, the Chief of Police Ebbe Hallberg was there with some constables who let the funeral procession itself pass, but cut off the thousands that followed behind it, not allowing them to join. But of course, they ran around side streets of the neighborhood and joined anyway. My mother helped carry the coffin of a child who died, Torgny Granberg. The victims now rest in the northwestern corner of the town’s central cemetery. There’s a very grand tombstone with an inscription, if it's still there, it has been at least 20 years since I was there. Lars Brännberg, born March 1943, lives in Luleå and is a senior citizen. He has worked as a construction worker, on a gas station, as an engineer in the construction sector as well as a representative for the leftist party. The last years of his professional life he worked at the local newspaper NSD. The Saltsjöbad Agreement was signed in 1938 between LO (The Swedish Trade Union Confederation) and Svenska Arbetsgivarföreningen (now the Confederation of Swedish Enterprise). The agreement was made with the aim that labour market parties should be able to regulate conditions and resolve conflicts without government involvement. Source: lo.se.